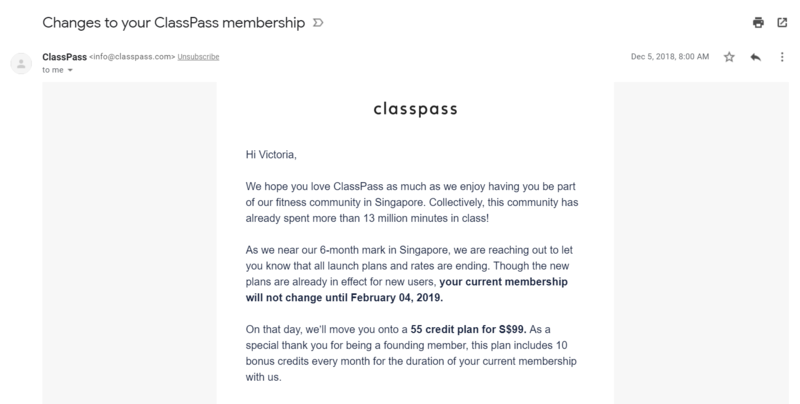 ClassPass Singapore Price Hike - Acquisition Likened To "Grab Monopoly"
ClassPass S'pore Hikes Fees By Up To 3x - One User Likens Its Acquisition To "Grab Monopoly"
ClassPass ends its promotional rates almost six months since launching in Singapore and raised them to up to three times more, causing discontentment amongst users. A user noted that ClassPass’ acquisition of GuavaPass is much like the Grab-Uber move. GuavaPass’ initial novelty in 2015 didn’t quite win me over as a young working adult who was fresh out of university. As I struggled to pay off student loans and my bills then, $169 for six months of unlimited classes felt like a scary commitment to a lifestyle that could turn out to be unsustainable. When news of the launch of US-based ClassPass in Singapore in July last year was announced, I rallied a few colleagues to try it out with me. After working for three years, ClassPass’ $50 for a 50 credits monthly package (and a $100 for 200 credits monthly package) sounded like a good bargain. We missed the initial two-month free trial, but we managed to enjoy two weeks of free trial where we were given 50 free credits to spend. The free trial was later shortened to just one week. 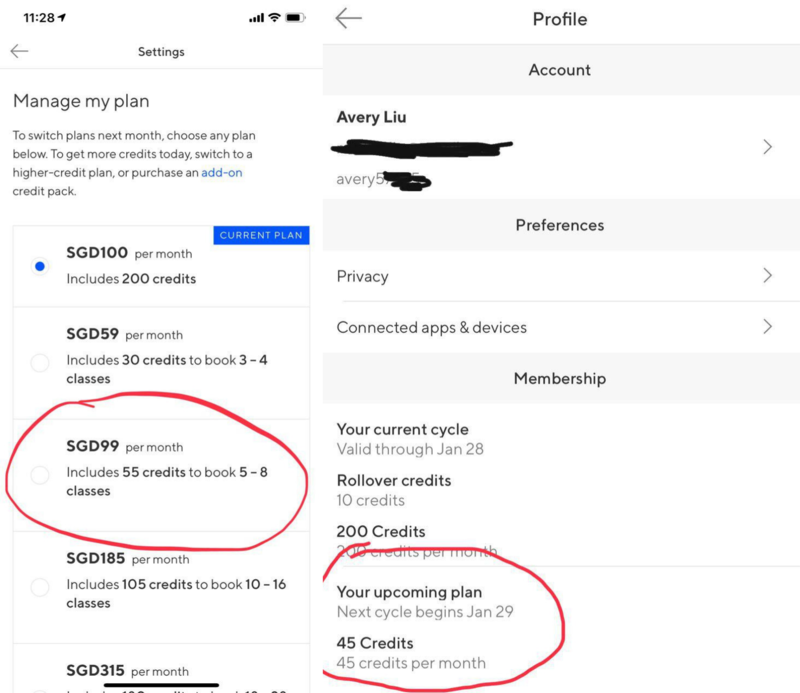 Wait – a “55 credit plan for S$99”?! That was double of what we were paying then. Now, monthly ClassPass packages start at $59 for only 25 credits while the package on the highest tier costs $315 for 150 credits. In a bid to retain founding members, ClassPass offers up to 30 more credits on the new packages. When I tried to cancel my membership through the app, I was directed to their ‘live’ chat where a bot first asked why I wanted to quit ClassPass. A customer service officer then took over the chat and offered me 50% off the 45-credit plan for the next month. It was a good offer as it is 50 cents cheaper than the plan I had, and with 5 more credits, but the offer is only valid for the next month, so I went ahead to cancel. The process was a good attempt at delaying cancellation rates in my opinion as they made me click twice on the ‘cancel’ link before I got to speak to the ‘live’ chat, and that added a hint of human touch. We weren’t the only ones disappointed by the price revisions. 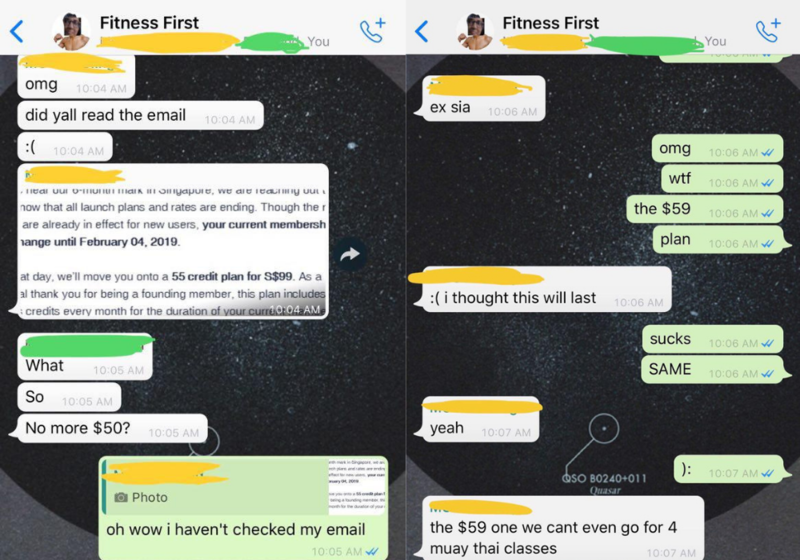 In a feature by Channel NewsAsia (CNA), they spoke to one former ClassPass user who was “happy” with the fitness subscription service up “until last month”, when she also received the notification email. Like me, she also took up the $50 package. “I was quite happy with ClassPass so I might have accepted a gradual price increase but by almost 100 per cent? That isn’t very fair or consumer-friendly,” the senior account manager told CNA. Curious about the general consensus among other ClassPass users, I reached out to a few more to find out about their experiences. Office worker Belle Lim signed up for ClassPass in August last year because she was looking to lose some weight and wanted to lead a healthier lifestyle, but also gets bored easily doing repetitive workouts. ClassPass’ diverse range of activities and “relatively cheap prices” kept her excited, which was motivating for her. When she found out about the price changes, she felt “a bit irritated” that it came so suddenly. But after some time, she decided to give ClassPass the benefit of the doubt. However, the 28-year-old still plans to cancel her plan before her billing cycle renews in February. That way, Belle believes she won’t be “tied down” by some of ClassPass’ regulations, like rushing to book in advance because the class has limited slots, or having to cancel 12 hours before class so credits won’t be forfeited. “Also, there are quite a number of free options I know now. After trying out different activities (on ClassPass) I kind of know what I like/don’t like. So I figured that I could just search for these free classes,” she added. In hindsight, she thinks that if ClassPass had stated clearly in the beginning that the rates were promotional, she would have felt better about it. 22-year-old Timothy Santos and former ClassPass member decided to cancel his subscription just last week citing the price hike as the reason. I mean, $59 for 30 credits, whut? I can do a lot more with the $50 for 50 credits, so I don’t think it’s still worth it [anymore]. He was “a bit sad” to quit ClassPass because he felt like it was such a pity that the deal is gone. Aside from using ClassPass, Timothy does his own workouts and sometimes join his friends too. Speaking to 27-year-old Dew Francis, he shared with me that he has not used a service like ClassPass or GuavaPass since he does cardio exercises without the need for classes. “While these classes definitely help to make workouts less boring, I feel like [it’s unnecessary] to pay for it when I can achieve my weight loss goals [with my own workouts],” he said. When asked if he thinks his gym membership is more value-for-money than a $59 monthly subscription at ClassPass, he broke it down for me carefully. To match his workout frequency using ClassPass, he calculated that it will cost him $168 based on the package price. After some consideration, Dew thinks he won’t be easily convinced to try a fitness subscription service but noted that it depends on every individual’s fitness goals. “[Having] determination is most important. Once you have that, you don’t need classes to keep fit,” he advised. But not everyone has ruled fitness subscription services out of their lives. I spoke to 27-year-old Avery Liu, who signed a six-month package at GuavaPass and got two months free. After two months, she paused her membership to try ClassPass, noting that GuavaPass allowed members to pause for free until August 2019. She then decided to become a ClassPass member because she felt that their plan was more flexible as GuavaPass only allows three visits to the same studio per month, forcing users to go to other studios to utilise the pass. As her GuavaPass membership was still on hold when news of the acquisition broke, she didn’t need to pay a cancellation fee or get a refund. Like Ms Nguyen, Avery also decided to keep her ClassPass membership because she believes that their rates are still “cheaper than most individual studios”. “And the best thing is, you can always change your exercise,” she added. For example, now that she feels sick of doing barre, she does more boxing, and if she feels like doing barre again, she can book a class anytime. However, one of her complaints about ClassPass is that they are “quite sneaky”, only informing members about the price change one month in advance. She also noticed that there may be a bug for founding members looking to choose their new packages. As a founding member, she is entitled to 10 more credits at $99 but her account shows 45 credits instead. When she reached out to ClassPass via email, they later clarified with her that she is entitled to the founding member rate and that it was an error. A ClassPass user, who wanted to be known only as Xinying, was initially “thrilled that ClassPass was ORIGINALLY providing such wallet-friendly pricing, and only had two straightforward packages to consider”. Despite finding it a slight inconvenience that new classes are released at 12pm daily as she “can’t do anything before and after” the time, she still decided to use ClassPass because of its “affordable package prices”. Similar to other respondents, she felt angry when she found out about the price change. “[They] decided to drop a bomb and reveal [their intentions like], ‘Oh, guess what, we have been in Singapore for six months now so the prices will now be a whopping three times the initial price’,” she ranted. But she continued being a ClassPass member after she clarified with them that founding member rates of 55 credits are monthly, not just for the first month of renewal, as she initially thought it would be. When asked if they would consider trying out another fitness subscription programme, Belle said she would if the price and offerings are attractive, a diverse range of activities, and flexible timings – factors that compelled her to sign up with ClassPass in the first place. Otherwise, she’ll look go for free activities, ad-hoc classes, or hold workout sessions with her exercise buddies. “If there’s a new competitor, I would surely join because their new rates are quite sh*t,” Avery said. In early January 2019, less than six months since launching here, it was announced that ClassPass has acquired GuavaPass, its Singapore-based rival, and the deal is expected to close end-January. Jeffrey Liu and Robert Pachter, founders of GuavaPass, along with select talents will be absorbed by ClassPass and all of GuavaPass’ operations in Asia will be taken over by ClassPass. This acquisition is reminiscent of the merger between Grab and Uber, however, it seems unlikely that it will cause as much fuss amongst consumers as its ride-hailing counterpart. Even though fitness subscription services have been present in Singapore since GuavaPass started in 2015, traction isn’t strong. We have exciting news – We’re joining forces with @classpass! Questions about your membership? Click the link in our bio! A service like this would be targeted mainly at expats or experienced PMETs (professionals, managers, executives and technicians) who work fixed, if not highly flexible hours, and who are able to commit and fully utilise it. Those who don’t fall into those categories could likely have been ignored by GuavaPass or made to feel like the service was unapproachable. When Temasek-backed ClassPass came to Singapore, it launched into an “aggressive bid for market share with competitive plans”, as described by CNA. As the US startup gained a stronger foothold in Singapore, it is likely that they have offered Liu and Pachter a lucrative deal that would allow them to continue crafting the “ultimate fitness experience” for the masses with GuavaPass. Alternatively, it could be that GuavaPass was losing so much market share or money in the past six months, prompting Liu and Pachter to opt for acquisition as an exit plan. A ClassPass spokesperson clarified with CNA that “that the price adjustments were ‘made independent of the acquisition'”. Back in October 2018, Vulcan Post received news of the partnership between “two homegrown fitness giants, UFIT and GuavaPass”. GuavaPass should stand to benefit on the addition of UFIT as its users gain one more studio and workout choice, and likewise, UFIT would be able to tap on GuavaPass customer base and expand on theirs. It is uncertain what the fate of UFIT is, post-acquisition. We’ve reached out to UFIT, and will update the article when we get a response.